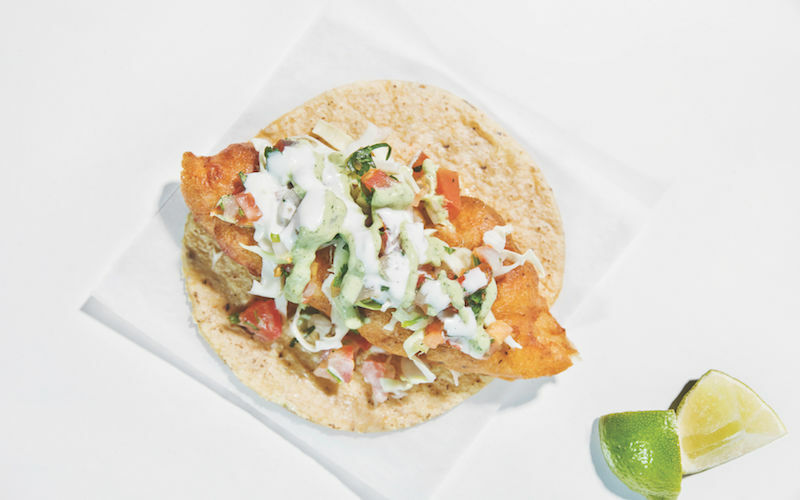 A specialty of the narrow peninsula between Mexico’s Sea of Cortez and the Pacific Ocean, the Baja-style fish taco has long inspired obsession north of the border. Supposedly influenced by tempura-loving Japanese fishermen who trawled waters off Baja California, the elemental combo of crunchy fish and warm tortillas is downright magical, especially when savored at one of Ensenada’s many beachside stands. It’s no surprise that two street-food chefs raised in Mexico’s fish-taco capital—Ricky Piña of Ricky’s Fish Tacos food truck and Juan Roberto Sanchez of L Fish Tacos in Boyle Heights—are frying up our city’s finest specimens. Follow these pescado purveyors on social media and, like us, get hooked. Mild, firm-fleshed white fish like tilapia is standard (Sanchez sources traditional Baja angel shark when available), but it’s the batter that makes these puffy, golden-brown strips stand out. Piña makes his own with oregano and mustard, while Sanchez uses a seasoned mix from famed Ensenada taqueria El Fenix. Fish tacos are usually dress-your-own affairs, but don’t skip a handful of finely chopped cabbage, offering a cool, crisp snap that contrasts with the battered fish. It’s sort of healthy, too, right? A hallmark of the Baja fish taco is the creamy white sauce drizzled on top. Most vendors use some blend of mayonnaise, milk, and thick crema agria (a Mexican sour cream that’s slightly salty). At L Fish, you’ll also find cremas flavored with cilantro or chipotle. Essential T: Ricky’s Fish Tacos Gets a New Look That’s 100% L.A.